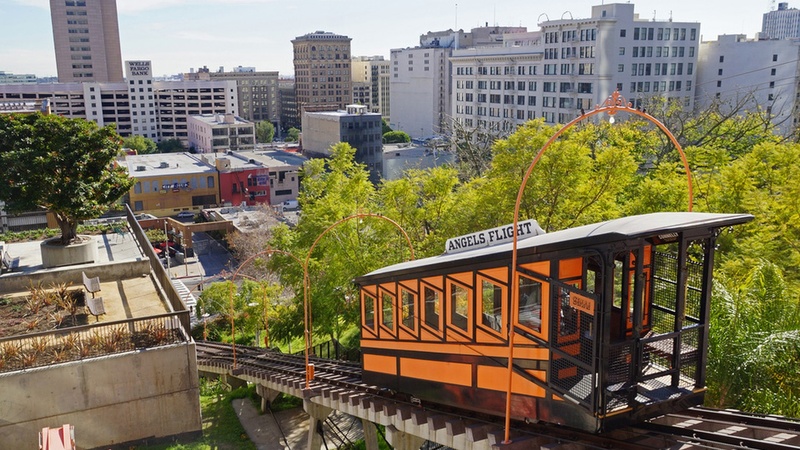 Angels Flight is one of those quintessential local attractions, like the Getty Observatory, the Hollywood Sign, Urban Light at LACMA and the Santa Monica Pier. It closed four years ago, but now the public can once again ride the train. There have been a number of safety issues with Angels Flight over the years, including a death in 2001 and a derailment in 2013. The railway was closed for a $5 million safety upgrade that includes new motors, a new evacuation staircase, and a fresh coat of orange paint for the two railcars, Sinai and Olivet. "There's been a tremendous amount of work done with a focus on safety. There's a lot of work that was required by the California Public Utilities Commission and the NTSB in the aftermath of some of those accidents, and we're absolutely 100 percent confident that Angels Flight will be safe for the public to use"" said Steve DeWitt, who oversaw the restoration for ACS Infrastructure, the company that will run Angels Flight. Now the railcars will once again be going up and down its 298 feet span on a 33 percent grade, connecting people to California Plaza at Olive at the top and Hill Street at the bottom. The railway has had its share of Hollywood moments… including a recent example that wasn't necessarily done on the up-and-up. In last year's La La Land, Ryan Gosling and Emma Stone share a kiss while riding up the train. Interestingly, that was shot without the proper permits. Reportedly, the California Public Utilities Commission, which oversees Angels Flight, didn't even know about it until the movie came out and LA Downtown News brought it to their attention. We understand some money changed hands to make the scene happened. Perhaps that money helped get the train back up and running. Angels Flight has been in a lot of other movies, including lots of film noir from the '40s and '50s. The story of Angels Flight mirrors the story of downtown. It opened in 1901, as the city was going through massive growth. At that point the city's western edge was MacArthur Park, and Boyle Heights was at the east end. It serviced the residents of Bunker Hill. Then tousands of those beautiful Victorian homes were torn down in the ‘60s during a time of urban renewal, a move that many now regret. And as part of that redevelopment Angel's Flight was closed in 1969. The second Angels Flight opened one half block south of the original location in 1996. Now Grand Central Market has had an overhaul and many new residents have moved to downtown, Angels Flight symbolizes a rebirth of that area, even as Bunker Hill is largely now a cultural and commercial destination and has far less housing -- and more expensive housing.